“Rongali- Celebrating Essence of Assam is being organized from 3rd, 4th, 5th April, 2015 at Khanapara, Veterinary ground with an objective to promote Assam as tourism destination and to build harmony amongst tribes & communities, Day long fun, festivities and the biggest musical festival ever in Assam. Come and enjoy Delicious food, traditional sports, colorful dance, Shopping Carnival and most importantly three evenings of scintillating music with the biggest stars of Assam and Fashion shows by the top Models and Designers of Assam. Visit and witness the biggest festival of Assam ever. 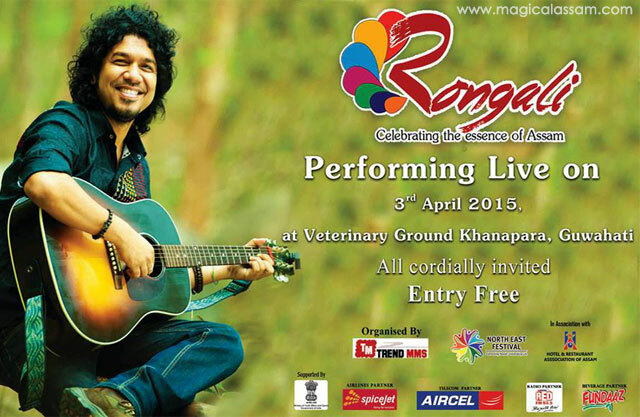 Venue: Veterinary College Ground, Khanapara, Guwahati.